Incidentally, it was a voice that drew Assad to make his latest film, the story of Mohammed Assaf, the winner of the 2013 “Arab Idol” singing competition who grew up in a refugee camp and subsequently survived on the streets of the Gaza Strip selling fish for shekels before flourishing in the public spotlight. It’s a situation that Assad could relate to, having become a pride of Palestine himself over the last decade with such Oscar-nominated films as “Omar” and “Paradise Now,” but for the filmmaker, it also offers an opportunity to show a warmer side that is closer to the kind, gregarious personality that one experiences when meeting him in person, a surprise considering his skill at creating serious-minded thrillers that are every bit as sober and sincere as they are tense. Still, “The Idol” is of a piece with the rest of Assad’s filmography, showing, remarkably, its young cast bounding through the devastation of the Gaza Strip in its opening moments to demonstrate the depths that Assaf will ultimately rise from, scraping by just to secure a few amplifiers and a guitar to play at weddings with his sister and subsequently suffering through her battle with kidney failure. But just as Assaf’s music is able to transcend whatever obstacles he’s confronted with, Assad’s ability to create powerful images crosses borders, tapping into a common desire to find something within oneself that can speak to the entire world that resonates. Shortly before the film arrives in America after a celebrated festival run, Assad spoke about the hot tip that led to his latest film, the logistical challenges of shooting some of the film in the Gaza Strip and recruiting actors from the area and why this was the first time he’s enjoyed being on set. Is it true your sister got you interested in this story? Yes. After winning the Jury Price of Un Certain Regard at the Cannes Film Festival, she asked me, “What are you going to do next?” I said, “I don’t know,” and she said, “Listen to this story.” When she finished, I asked, “This is true?” I went and did my research. I watched the last episode with everybody else, because he was not winning yet, but my sister expected it because she’s a musician and she said, “His voice is incredible.” When I was with everybody at the [town] square, I was moved by the fact that singing was uniting people old and young, the rich and poor, Christians and Muslims — they came together to listen to this one voice. I saw how art can change ugliness to beauty and give hope that you can do something about your situation. We live in dark times and I realized how important the role of art is now, so when it was offered to me, I wanted to tell this story. Even though it fits in thematically with your previous films, it feels like it is a lighter film. Did you have to approach it differently? Because you cast actors from Gaza, I understand you weren’t able to meet them in person before filming, so what was it like finding your Mohammed without that? You’re not allowed to go in and out of Gaza without a lot of permissions. We saw a lot of people on Skype. As you see in the movie, it can be a bad connection and you have a funny situation, but also if you’re interviewing somebody through Skype, it’s easy to go out of their [sightline] and you can talk to the casting director [off to the side to not make them feel self-conscious] and they don’t know. You can’t whisper while the actor is still here, but on Skype, we had fun because we would laugh and we were more free to do things. I enjoyed the Skype screen tests. Was it different working with younger actors, and non-professionals to boot, for such an large part of the movie? I was so scared in the beginning because the kids came just one day before the start of the shoot. 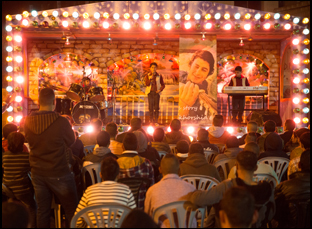 We cast them through Skype, but then they had to go out of Gaza, which was a nightmare. Finally, we got them out the day before the shoot, but I did not have time to rehearse, to give them training, and the plan was to give them workshops. During the workshop, we could discover [scenes and make it clear] it’s not the words [that are important], they could change it.” The most important thing I did with them was to let them feel secure. They’re far from their family. It’s a new environment. They’ve never seen a film set before. Sometimes just the lights are scary, so I created kind of a playground for them. They started to make jokes with everybody. They understood that when I said “action,” they become the characters, but they were still joking every second before I say “action.” When we had a slate [to start a scene], they would tease the camera assistants, but when you want to clap, they would seize it, like it’s no joke anymore. They were very professional and I think we succeeded by letting them feel that they could play. Physically, you seemed to turn Gaza into a playground, to go by the opening scene in the film where the kids run rampant through the streets. Was that insane to pull off? It was. We were crazy sometimes. I think all the film people are crazy people. Sometimes they do things, and it looks on screen like, “Okay,” but in reality, [you wonder] how did this happen? How did you let kids run over buses that are moving? We had stuntmen with training, but still with the crowds and jumping when you are in filming, you become a fighter. All the big, important scenes for Gaza [were saved for the end of the shoot] — the [opening] scene, [and the shots of] the wide streets, the shops, the people because I know you have to do it in Gaza. The interior locations, it doesn’t matter if you shoot it in Gaza, or in Jenin, West Bank. Every day was crazy, but making “Paradise Now” was almost as difficult as the story itself and “Omar” was as difficult as the story itself. 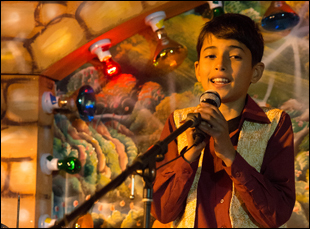 Making “The Idol” was difficult, but also as joyful as the story itself. It started a little bit difficult, then slowly by the end of it, for the first time in my life, I enjoyed being on set. Mostly on set, you’re just fighting — fighting the light, the weather, the actors, your crew — and everybody is, for better results. You’re not fighting for bad causes, but still it’s fighting. It’s stress. “The Idol” was the first movie that I enjoyed making, [partly] because I think the story is so emotional touching, but also so uplifting. Do the songs that Mohammed sings — in particular the one where he is with the sister at the hospital, or the one where he is with the girls in the car — have any particular significance? Sure, but you don’t need to know the text. Sometimes music speaks with the music rather than with the lyrics. The first time you hear any song, you don’t really pay attention to the lyrics — you just hear the music and later you realize my God, the lyrics are so good. So when he’s singing for his sister, it’s a goodbye song, and when he is singing for the girls in the car, it’s about regaining his belief in humanity. It is a puzzle of how you can choose the songs in order to help the structure of the drama and it was like three songs we found out that they will help us, and other three we had to rewrite musically, but when you do the music right, then the editing becomes very easy to exactly get what you want, which is to let the audience go through this journey of self-discovery. 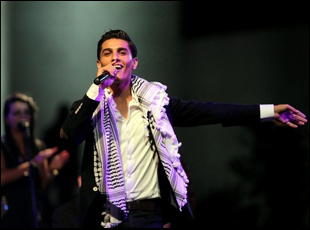 The real Mohammed Assaf has a cameo, but is it true you initially wanted him to play himself? After two weeks of training, we realized both that it’s not time for him. He said to me, “Hany, I’m already a singer. You want to make me an actor too? It’s too much.” I really tried hard. How did “Where Do We Go Now?” director Nadine Labaki end up making a cameo? Did witnessing the power that this had as a cultural event reinforce or perhaps change how you thought about what you’re able to do as a filmmaker with the power these images have? I think we’re losing our faith in humanity, not just in the Middle East, but everywhere in the world, and this restored it. We’re becoming more and more pessimistic. When you make any art that is based on reality, restoring that faith [becomes] a greater job. You can make small corrections towards the belief that we as human beings are able to see what’s good, and what’s bad, and to fight the burden ourselves and I feel these kind of movies can have their role in the story of believing in others, and in yourself. You were able to bring the kids from the film to its world premiere in Toronto, which would seem to mirror the same journey of Mohammed in stepping out onto the global stage from Gaza. Was that special for you? You realize how difficult it is to be a young man or woman from Gaza. It’s like everything is closed and everything is a struggle, but you realize that it makes you strong. You don’t need just to see the dark side of it. It makes you a fighter and it makes you appreciate everything in life. These kids were appreciating everything that was being done outside of Gaza. Other kids would be so spoiled [they might say], “Oh, I want more. I want more!” The kids from Gaza were enjoying every second, because they realized that you need to enjoy your moment, because this moment, you’re going to lose it very soon, and there’s not just a bad side to it, but a good side. You currently are attached to make “The Mountains Between Us” with Idris Elba, but there was another project that was intriguing. Is it true you might be collaborating with “Waltz with Bashir” director Ari Folman? It’s possible. It’s not yet a concrete plan, but we have the desire to work together, a very strong desire. I love Ari Folman. What’s clear is that your next film likely won’t be exclusively based in Palestine. Is it important for you to do some different? I really want to make a bigger experience for myself, and I don’t know if the side effect will be good for others, but it’s good [for me] to make an international movie [at this time]. Actually, I always almost the same themes [every film] — normally people stuck in situations that aren’t normal. Look to all my films, but it’s good now to do that in a way that it will reach out to other audiences, and also to work with an experienced machine in telling stories. Whether you agree with [the stories they tell] or not, the most experienced in storytelling is Hollywood. They’re not always [making] the right decisions, but they have the experience of reaching as many as possible people. “The Idol” opens on April 27th in limited release across the country. A full list of theaters and dates is here.